The first sod was turned on the Tauranga Harbour Marine Precinct on 29 September, marking the beginning of the construction of the future marine hub of the Bay. A small group of representatives from Tauranga City Council, Bay of Plenty Regional Council, local iwi and marine businesses gathered at the precinct site at dawn. Kaumatua Peri Kohu, representing local hapu Ngai Tamarawaho, delivered a karakia (blessing) wishing the project well going forward. 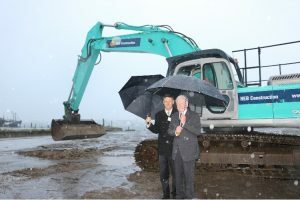 After a few short speeches, Tauranga City Mayor Stuart Crosby and Bay of Plenty Regional Councillor Philip Sherry broke the ground – trading the traditional spade for a sizeable excavator, which will soon be in operation at the site. Construction is set to begin next week when HEB Construction (HEB) takes over the site for an 11-month programme of works. HEB was selected as civil works contractors for the Marine Precinct primary works. HEB is one of the leading civil construction companies in New Zealand, headquartered in Mount Maunganui. After being selected as the preferred contractor, HEB worked closely with Marine Precinct Project Director Phil Wardale to develop the best engineering design solutions for the project. “We really enjoyed working with HEB to refine the tendered design. HEB provided us with value engineering solutions and alternatives, which will enable us to deliver a quality precinct within the project budget,” says Phil. The contract awarded to HEB has a value of $6.5 million. Deliverables include the 6,300 square metre heavy-duty hardstand (pavement), a new concrete wharf, a lifting bay complete with runways for the vessel hoist, seawall armour rock protection, access roads and other core infrastructure services to the new lots. Based on current construction timeframes, assuming no significant weather-related delays, construction would be completed in August 2017. The vessel-hoist would be delivered at the same time, prior to being assembled and tested on-site. Opening of the precinct is pencilled in for September 2017. The Tauranga Harbour Marine Precinct is an $11.4m project to deliver a purpose-built marine servicing facility at Sulphur Point. The precinct will provide a base for boat building and refit businesses in Tauranga and will be managed by Tauranga City Council under the Vessel Works brand. By mid-2017 (stage 1 development), the precinct will include lots in a range of sizes for marine businesses, a 6,300m2 vessel storage area (hardstand), deep-water marina berths for large vessels and New Zealand’s largest vessel hoist (350-tonne haulage capacity and extra-wide). Further development (more lots, extension to the hardstand) will be undertaken in stages, based on demand from the industry. The Bay of Plenty Regional Council is the funding partner for the Marine Precinct project, contributing $5 million through the Regional Infrastructure Fund. Tauranga City Council’s $6.4 million contribution will be partially offset by the sale of properties on and near the site.